It is not uncommon for me to receive a call or an e-mail from an alum with an offer of a donation to the Archives. In this posting I would like to tell you a little bit about two items that came to the Archives recently. Greg Miller [W1983] contacted me about an unusual cap he had just purchased, double billed and in good shape. I couldn’t wait to see it and here is a picture of this unusual hat. Right away I knew that this was a class cap and in perfect shape, too! Not only in great shape, but the only one of its kind here in the Archives. A truly great gift from Greg. As I was looking for information on the class caps I came across some information that put another gift to the Archives into better focus. Among the people I work with frequently are the folks with a passion for local history. The Director of the Lew Wallace Study Preservation Society, Larry Paarlburg is one of those most interested in Indiana history. Larry and his family have their roots in Kirklin, Indiana and he had often mentioned his family’s connection to Wabash. One day Larry dropped in with a cap from his great uncle’s things. Here is a picture of Larry’s gift to the Archives. 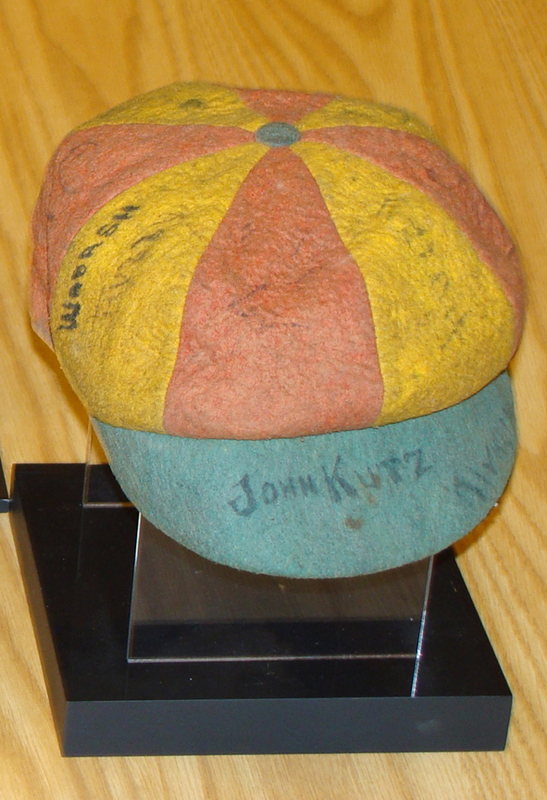 As his great-uncle, John Kutz [W1914] was quite a baseball player, we assumed that this might be an early baseball cap. 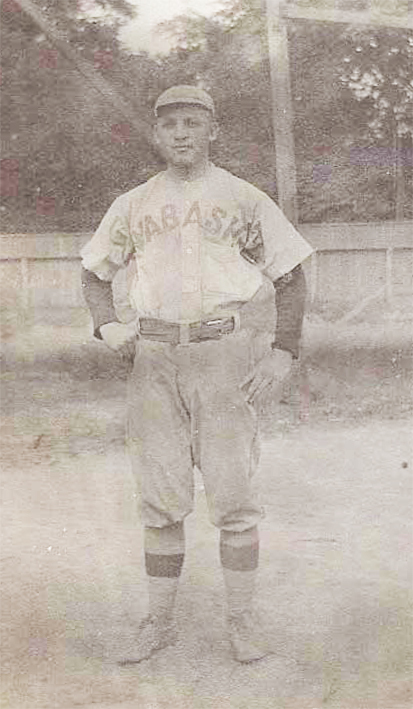 Here is a picture of John in his Wabash baseball uniform. It was only while searching for information on Greg’s gift that I found the real story of this colorful hat. 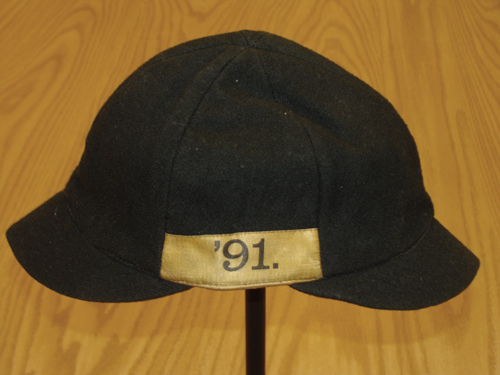 It was not a baseball cap, but the cap chosen for the class of 1914. It was nicknamed the “Sunflower” and the Bachelor gave us the rules for the wearing of it, “All freshmen must wear freshman caps in Crawfordsville every day of the week except Sunday. All other varieties of headgear are liable to confiscation at any time, except on Sunday, and at any place, except social functions in the evening, matinee dances, and afternoon weddings and teas.” In another Bachelor entry we get a slightly different take on the tradition, “See to it When you appear in the holy precincts of our royal institution of learning, except on Sundays and holidays, that ye adorn your empty bone with the gaily colored headgear provided for that portion of your swiney anatomy.” Just like the language from the Rhynie, Read and Tremble posters so familiar to Wabash men of a certain era. This tradition of picking out different caps for different classes morphed into one hat for all the classes – the familiar red cap with the fetching green bill. So now we know a little more about both of these hats. This posting is a great way to highlight the value of gifts to the history. It also is a reminder to me to say again to all who have given, to Greg and to Larry and to all who offer these treasures – thank you!